No. 1596: The First Automobile? Click here for audio of Episode 1596. Today, let's try to find the first automobile. The University of Houston's College of Engineering presents this series about the machines that make our civilization run, and the people whose ingenuity created them. The automobile is one more invention that always seems to have just one more antecedent. The earliest steam-powered car we know about was finished as early as 1769 by French inventor Nicolas Cugnot. It was a large three-wheeled vehicle that moved at the speed of a walk and was meant to haul cannon. Earlier cars had been driven by springs and compressed air. Windmill-powered vehicles were made before them. Leonardo da Vinci sketched self-powered vehicles, and even Homer wrote about them. So let's limit our search to autos driven by internal combustion, and to ones actually built. We usually give that prize to Carl Benz. Benz championed the new internal-combustion engines, and he worked single-mindedly to create a car driven by one. He built a little three-wheeled car in 1885 and sold his first one two years later. He went into production with a four-wheeled model in 1890, and the Mercedes-Benz company is still with us. But Benz wasn't first. 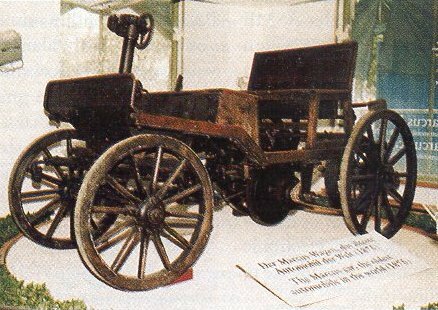 The French inventor de Rochas built an auto, and an engine to drive it, in 1862. Two years later, the Austrian Siegfried Markus began working on cars. His second one was rediscovered in 1950. It'd been bricked up behind a false wall in the cellar of a Viennese museum to hide it from the Germans. Markus was Jewish, and the Nazis had orders to destroy his car and any literature describing it. By the way, when the car was rediscovered, it could still be driven. Markus' story is especially poignant because, if the German Benz believed in the auto, he didn't. In 1898, Markus was invited to be guest of honor at the Austrian Auto Club. He declined, calling the whole idea of the auto "a senseless waste of time and effort." The search for the earliest internal-combustion-driven auto might end in England in 1826. An engineer named Samuel Brown adapted an old Newcomen steam engine to burn gas, and he used it to power his auto up Shooter's Hill in London. And here the whole priority question mires into hair-splitting definitions. What we usually do in these cases is pretty arbitrary. We credit the first commercial success. That's how Edison gets credit for the light bulb and Fulton for the steamboat. By that definition, Benz did invent the automobile. Automotive historian James Flink notes that modern bicycles came into being just as Benz began his work, and they sparked the public demand for personal vehicles. But bicycle-makers were the same people who went on to make, first motorcycles, then airplanes. They sowed the demand and then veered off into another technology altogether. The people who took up automobiles were closer kin to the railway business. For a brief time, it looked as though the steam car might beat out internal combustion. So, if we go back to star-crossed priority questions, we probably have to follow the thread of steam. And that leads, not to Benz, but to Cugnot, well over two centuries ago. Flink, J. J., Innovation in Automotive Technology. American Scientist, Vol. 73, March/April 1985, pp. 151-161. Derby, T. K., and Williams, T. I., A Short History of Technology. New York: Oxford University Press, 1960/1975. This is a greatly revised version of Episode 125.